Our exclusive Good Times, Always Open themed man cave sign now comes personalized. Purchase for your favorite man cave owner or hang in your own Man Cave. 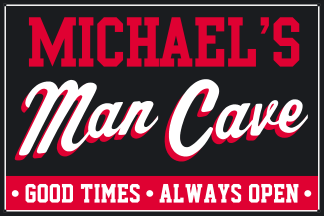 This Personalized Man Cave Metal Sign - Good Times, Always Open comes personalized with your name up to 20 characters long and comes in all uppercase letters.